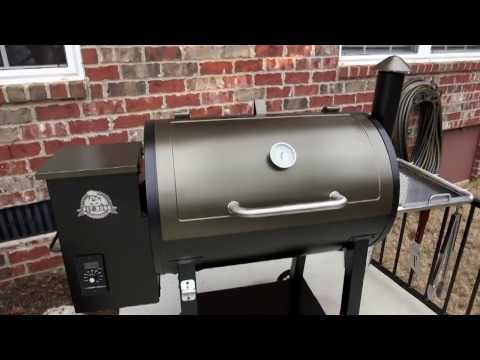 Get ready to grill, bake, smoke, roast, sear, braise, char-grill, and BBQ with all-natural hardwood pellets that give your food authentic, wood fired flavor on the Pit Boss 820 Deluxe Pellet Grill. This deluxe model features a copper finish on the hopper lid and chimney cap, as well as a removable stainless steel side shelf that doubles as a serving tray. The 820 Deluxe also has 820 square inches of grilling space with 575 square inches on the main grid level, made of porcelain coated cast iron, and 243 square inches on the upper rack, made of porcelain coated steel. Dial in your desired temperatures as low as 180 degrees for low and slow and as high as 500 degrees for fiery and fast cooking. The LED readout allows you to set your grill temperature and forget about it while the grill does the work of monitoring temperature and feeding wood pellets into the burn pot where they will be ignited. You can keep an eye on the internal temperature of the grill with the built-in dome thermometer while you crack open a beer with the built-in bottle opener. The curved flame broiler, at the bottom of the grill, gives the food drippings more time to sizzle, adding flavor back to your food, while also directing the run off grease into a grease bucket. There is a simple slide plate that, when closed, allows you the option of indirect, smoker style cooking, great for smoking and baking. When the flame broiler is slid open you have a direct flame set-up, perfect for beautiful seared steaks and flame kissed burgers. When the slide is closed you can use the Pit Boss 820 Deluxe fan forced convection system that circulates air throughout the cooking chamber creating an even temperature throughout the grill, and removes the need for a rotisserie. Heavy duty steel construction is finished with a durable powder coating made to withstand high cooking temperatures. This grill will reach up to 40,000 BTU. The hopper is able to hold up to 19 lbs of pellets and includes a safety grid. The Pit Boss 820 Deluxe will need a standard 120-volt outlet to power the reliable 200-watt auto igniter and the automatic start and cool down cycle. The stainless steel side shelf comes with tool hooks and has a removable serving tray for easy hosting. The bottom shelf adds stability to you cart while also adding more storage space. This grill also features a pair of durable heavy-duty caster wheels for easy rolling, a removable flavor guard that allows for simple cleaning, and a pellet clean out door so you can keep your unused pellets protected and dry between uses. The Pit Boss wood pellet barbecue line, manufactured by Danson Inc., carries a one (1) year limited warranty for from the date of sale to the original owner only, against defects and workmanship on all steel parts, (excluding the burn pot), and one (1) year on electrical components. There is no specific warranty on the paint, burn pot, flame deflector, grill cover, and all gaskets or against damage caused by corrosion. More details in your owners manual. I would absolutely buy this again! I have done my homework regarding my recent purchase of my PB820D. My in-laws have a TREAGER and we loved eating on it. What a great unit, but the price point is high. I set out to find as close to the Treager as I could get for the money. I kept coming back to the Pit Boss... Don't let anyone fool you regarding construction, the Pit Boss is very close, GM, and the Louisiana... I have a dial vs a push button, both digital!?!... I do not have a prob but have a thermometer!?!... I compared the big names here and have enjoyed my in-laws king of the hill Treager for years. I am flat out turning out meat just as juice, and just as smoke filled with flavor for days.... People can say what ever they want about the PB, I love mine and I will absolutely buy another one when this one die's.. Smoking meat is 90% prep and 10% smoke, and it all means nothing if you are not having fun!!! Smoking becomes a passion that starts as a hobby. Enjoy fellow pit masters. Hello. You get fit around 6 racks of ribs or 7 whole chickens in this grill. WARNING: Use of this product can expose you to substances and chemicals including wood dust, which is known to the State of California to cause cancer, and carbon monoxide, which is known to the State of California to cause birth defects or other reproductive harm. For more information, go to www.P65Warnings.ca.gov.